Here's a really GREAT idea! 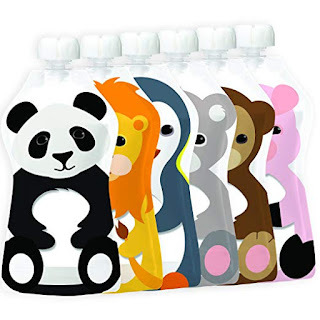 Right now these Squooshi Reusable Food Pouch | Animal 6 Pack | 6 Large Pouches $10.49 (Retail $14.99). •NEW ANIMALS! NEW SOFTER MATERIAL! LARGE WINDOWS! •EASY TO USE - NEW CLEAR BELLY - EASIER TO VIEW CONTENTS! Our straight forward shape with a top spout and wide bottom zipper allow you to easily fill your Squooshi pouches with your favorite squishy food by using a regular spoon or pour directly into the pouch from your blender of choice. Fill. Eat. Wash. Repeat. It's that easy! •EASY TO CLEAN - Wash by hand with warm soapy water and a bottle brush or place in the top rack of your dishwasher. Bottom zipper &amp; rounded shape allows for a complete rinse of water to stream through pouch. Bottom zipper allows for pouch to be fully opened to air dry. No corners or cracks for food to get stuck. •MADE WITH FAMILY IN MIND - Made to last with durable, BPA, Phthlate, PVC &amp; Lead Free materials with a no choke cap.